With developers working on it both around the globe and around the clock, new free music software hits the internet at a staggering rate. Here's what's new from the past seven days. 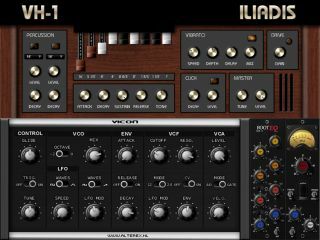 A drawbar organ is a must for every plug-in rack, and Iliadis has a new one in the shape of the VH-1. This is 64-note polyphonic, and comes with nine adjustable drawbars and two percussion oscillators. Effects include a chorus vibrato, overdrive and key click. Inspired by (but not a copy of) Technosaurus's Microcon hardware synth, ViCON is a simple monophonic synthesizer. It's not exactly bursting with features, but if your brain's been fried by some of the more complex commercial plug-in instruments on the market, this could be a blessing. Comprising "a crossover frequency splitter followed by a distorting waveshaper in each band", this is a plug-in that promises to deliver smooth harmonic distortion (low and high frequencies can be processed separately). It's open-source, so you can even modify the code if you're that way inclined. As well as offering a 4-band parametric EQ (this is said to sound 'musical' and be suitable for mixing purposes), this also contains a signal-modelled preamp simulation. Oh, and there's an analogue-style VU meter, too, which is always good news in our book.